From the moment of conception we want nothing but the best for our children. We often wonder what they will be when they grow up. What will their interests be? Will they follow their dreams? And what will those dreams be? I believe we should nurture the natural abilities and interests our children have from a young age. These interests and abilities come natural to them. And when we force them to be something they're not or do something they don't want (career path) they will end up being miserable......every now and then there might be a happy adult that comes out of that. BUT, what if we were to watch them, learn from them, observe them using their interests and abilities during play time.....and then, we help to nurture those interests and abilities....those talents and gifts!! I manufacture bath and body products, and I work in the nail care industry specializing in diabetic foot care. Why is this important? Well, when I was a young girl I used to take my mother's perfumes, powders and lotions and lock myself in the bathroom to create my own concoctions. This would be an early interest in what I am doing today with the bath and body products. I've always enjoyed caring for people. I did work in the health care industry but wasn't fond of that. So being a Nail Tech specializing in diabetic foot care (and providing in home services to folks who are home bound) gives me that same opportunity to take care of others. I knew at a young age that I enjoyed creating scented products and helping people. But I never expressed that to my parents or anyone else (thus, locking myself away in the bathroom to make my concoctions). Had I made it known I know that my parents would have nurtured that in me. Thankfully, I found my way to a career that I love. My next example is one of my own children....my oldest son, Anthony. 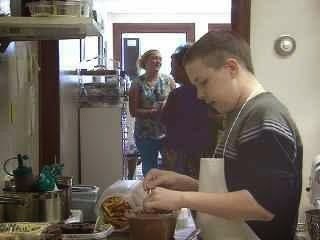 He expressed to me when he was 12/13 years old that he wanted to be a Chef. I put my own things on hold and we opened a chocolate business for my son so that he could get some experience in the food biz. Of course, this wasn't a full blown restaurant (we didn't have the finances for that so we did what we could with our budget...which was chocolates and coffees). I remember so many people telling me how crazy I was because my son would change his mind many times by the time he is actually an adult. I remember people telling me I was wasting our financial resources and our time on doing this for him. I have news for all those who claimed I was wasting resources.......he is now a Sous Chef and he is nearly 25 years old. He might not care much for making chocolates anymore, LOL, but that experience helped to nurture what was natural for him....what he enjoyed doing. Then he went on to college and seeking out his own path into the culinary industry on his own. I take no credit for his abilities, talents and gifts.....that's all God and my son. But the point here is this, nurture the interests, abilities, talents and gifts in your children when they are young.